Can (intense) violence be used to communicate a message about antiviolence? If Shinya Tsukamoto begun giving a reply to this question with “Fires on the Plain”, this time, he gives a definite one, and in the most stunning matter. After 250 years of peace, the idle samurais hear again the bells of war in the mid 19th century coming from Edo, as the “negotiations” with the Americans start taking place. Mokunoshin Tsuzuki is another masterless samurai, who earns his living by working in the rice paddies of an isolated farm, while honing his skills by sparring with the family’s son, Ichisuke, who dreams of becoming a samurai, despite the fact the he was born a peasant. At the same time, the beginning of a subtle romance seems to take place between Tsuzuki and Yu, the family’s daughter despite the fact that the girl disapproves of her brother’s dealings with the samurai ways. Nevertheless, the sudden appearance of Jirozaemon Sawamura, a veteran samurai who is in search for talented warriors that will fight for the shogun’s side, and of a band of ragtag ronins, changes the lives of all involved forever, as the cycle of violence opens. This “opening” is where Tsukamoto’s main comments lie: Once violence ensues, no one remains unaffected, despite his degree of involvement, and the closing of the cycle is as difficult as its opening is easy. His approach towards the presentation of the aforementioned borders on the extreme, as he does not shy away from the violence even a bit, with the tendency finding its apogee in the scene in a small cave, which could be easily described as butchering. The amount of violence in the film, however, does not hide his messages by any means, as his hatred for war and violence in general extends to the concept of revenge, human nature (in terms of how people cherish violence when they benefit from it), and the fact that samurai swordsmanship may look impressive and noble, but in reality, its only purpose is to kill. Through this last concept, and particularly through Sawamura’s continuous will to follow its rules, Tsukamoto seems to highlight the futility of Bushido, in a fashion similar to the one presented in films such as “Harakiri” and “Samurai Rebellion”, where the “nobleness” of Bushido was completely deconstructed. The beauty of the samurai ways and particularly of the swordsmanship is also highlighted through Tsukamoto’s and Satoshi Hayashi’s cinematography, with Tsuzuki functioning as the vessel for this tactic, but this lasts only briefly, as the reality deriving mostly from violence eventually takes over, again deconstructing anything about the concept that could be described as even remotely positive. Tsuzuki, through a great performance by Sosuke Ikematsu, also stresses the fact that even samurais are “normal” people, as his actions are also dictated by fear and occasionally, by lust, with Tsukamoto inducing the film with some elements of (perverse) sensuality through this last concept. The blame for the blights that befell people at the time lie mostly on the previous generation, according to the film, with Tsukamoto as Sawamura highlighting the fact that his generation swept the new one towards a direction its members did not want to go (as presented by Tsuzuki). At the same time, the story also somewhat justifies this act as a necessity due to the circumstances of the times, as dictated by the band of ronins that appear in the area. The role peasants play in this concept is also excellently portrayed by Yu Aoi as Yu and Ryusei Maeda as Ichisuke, whose sole roles are the ones of the victim, with the former’s performance giving a truly tragic tone to this idea, while highlighting the fact that at times as the ones the story unfolds in, love is also nothing but a burden, another sentiment that leads to despair. Tsukamoto’s editing induces the film with a rather fast pace, while also retaining, at times, a nightmarish atmosphere, a sense that is also heightened by the use of shaky handheld camera. This last aspect somewhat faults the various action scenes, but even this “fault” falls under the general style of the film, that has the samurai ways stripped of any kind of nobility. The element, though, that actually elevates the film to a very high level is late Chu Ichikawa’s music, whose electronic and percussion sounds accompany, and occasionally dictate the atmosphere in the most impressive fashion, with the ending titles scene highlighting the fact to the fullest. 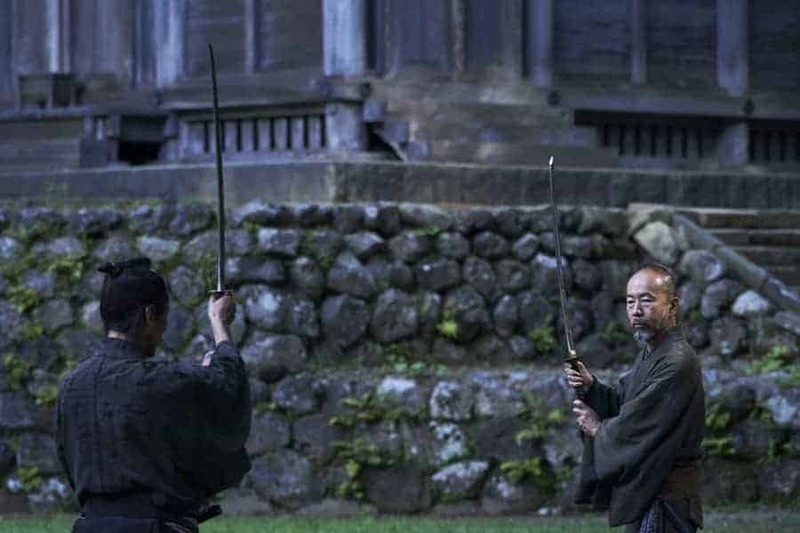 “Killing” presents an impressive combination of meaningfulness and aesthetics that results in one of the best films of the year, and a truly worthy entry to the samurai genre, through its extreme, but quite realistic approach to the whole concept.